Village spokesperson Epeli Cokanasiga said three houses were swamped by flood­waters but the occupants were safe. Mr Cokanasiga said they were closely monitoring the weather reports. The Fiji Meteorological Services report on May 26, 2017 for the forecast to midnight to­night for the Fiji group explained the situa­tion in Kadavu. The report said that a high pressure sys­tem together with a low pressure system to the far southwest of Fiji would generate and direct moderate to heavy southerly swells towards the group. It said that for low lying coastal areas of Kadavu, Beqa, Vatulele, Southern Lau Group, Mamanuca Group, Southern and Western Viti Levu sea flooding was likely to occur especially during high tides. In Qauia Settlement, Lami, just outside Suva, villagers faced flash flooding right up to the bridge. The Fiji Sun visited the area yesterday not­ing that children were swimming and were at risk. 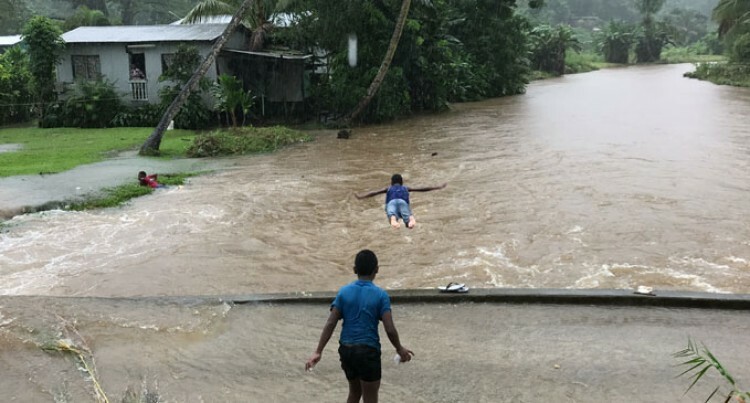 During a press conference in Nadi yester­day Fiji Meteorological Services director, Ravind Kumar advised the public to take precautions. He said the trough of low pressure was expected to bring flash floods in low lying areas causing roads to go underwater, tidal (swells) waves in low lying maritime areas and thunderstorms. The low pressure at the time this story went to press lay just West of Fiji but was moving towards the group. “It is expected to bring heavy rain, squally thunderstorms with strong and gusty winds over the country from tonight (last night) and continue until tomorrow (today),” Mr Kumar said. Mr Kumar said there was a high chance of flash flooding where the occurrence of per­sistent localised heavy falls was expected. “The risk of flash flooding is elevated dur­ing the high tide, coinciding with damaging heavy swells that is predicted,” he said. “Therefore, communities living in low ly­ing coastal areas, flood and landslide prone areas are advised to be alert and take neces­sary precautions if necessary. “Members of the public are encouraged to stay safe and do not attempt to cross flooded, drains, roads or bridges. Similarly, for those using the Queens Road along the Coral Coast, he said should remain alert for occasional over-wash of roads during high tides. A similar outlook is likely today. Meanwhile, the Frank Hilton Organisation Fiji statement said that because of damages caused by the rain, Hilton Early Interven­tion Centre was closed to all students today.